Almost eight weeks after City University London became the Education Sponsor of Hackney House, the landmark Shoreditch High Street building continues to be a significant bridgehead into the bustling Tech City arena, showcasing the University's vibrant work in innovation, business development and excellent academic research. Indeed, Hackney House has provided yet another opportunity to reinforce City's image as London's preeminent university for business and the professions. Hackney House, designed by architectural firm Ellis Miller, is an unusual, one-off structure, created as a networking venue for media, businesses and investors. The venue, with its trademark 'Big Top', served as Hackney Council's Inward Investment and Media Centre for the recently concluded 2012 Olympic Games and also houses the United Kingdom Trade & Investment (UKTI) Tech City Investment Suite which showcases London's digital technology sector to global investors. City's participation in Hackney House's programme of daily activities incorporated support for events focused on Hackney's storied history of design, fashion, leisure and regeneration. As a Gold sponsor of the Digital Shoreditch festival in May this year, City University London successfully staged the Innovate Day at Hackney House alongside a number of London-based universities. Hackney House was open throughout the period of the London 2012 Olympic Games. More events are scheduled to take place there during the Paralympic Games - 29 August to 9 September. As the education partner, City has also been commissioned to carry out a post-Olympics evaluation of Hackney House, taking into consideration the impact of the Games on inward investment and regeneration for the Hackney area. The recent highlights of the last three weeks at Hackney House include the City-inspired Digital Shoreditch Creative Tech Day and City's 'Digital City' evening reception, held on 30 July. The day featured an eye-tracker demonstration by staff from the Interaction Lab of the School of Informatics, as well as a presentation on creativity by the Sir John Cass Business School's Professor Clive Holtham and lecturer Habib Lesevic. Leo Castellanos of the London City Incubator also gave a presentation about investment readiness. During the evening there were brief addresses from Cass Business School's Steve Haberman and Visiting Professor and Placr CEO, Jonathan Raper, of City's School of Informatics. Dr Sue O'Hare, Director of City's Enterprise Office, says Hackney House had been a "buzzy and eclectic environment" for networking and building relationships. She added: "The past three weeks have been an extremely intensive and also extremely valuable period. I'm delighted that City has been able to be a part of it, and to weave itself much more tightly into the local network." During this period more than 12,000 people have passed through Hackney House's doors. There have been events on most days along with a parallel evening entertainment programme, featuring the likes of Hardeep Kohli Singh, Little Boots, Paloma Faith and The Guillemots. "Hackney House is a first for Hackney and a great opportunity to showcase our creative talents to the world. 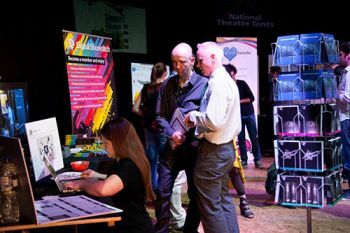 We had over 12,000 investors, business people, artists and creative industry practitioners through the door networking, assessing investment and business". Hackney House has also been important to City University for facilitating student placements, for graduate recruitment, and for overall collaboration between academia and the business community. City's stand throughout the programme of events so far has showcased offers to Tech City businesses and potential students (including executive education from Cass Business School, short courses from the Enterprise Office, and the exceptional Masters in Innovation Creativity and Leadership). Students and faculty from the City University Journalism School produced a digital newspaper chronicling events taking place at Hackney House since May, the Digital City Daily.